This was my first trip to Rachel and the adjoining area but turned out to be a fun experience. Drove up I-15 then Hwy 93 to 318 then 375 from Las Vegas. Passing Nellis AFB on I-15 saw quite a few F-15's taking off and some landing also. Enjoyed the scenery on the way North up 93 as it had rained the day and night before and the dessert was really "Blooming" especially for June. Was amazed that I had cell phone reception until I went thru Hancock Summit. ET Highway signs were fun but awfully defaced with stickers and graffiti. The State Highway Dept.should clean or replace them occasionally. 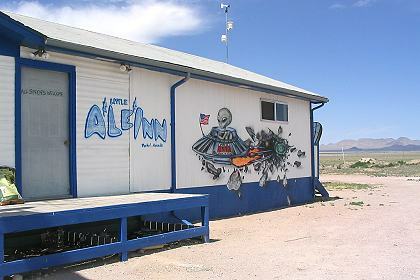 After passing turn off to Groom Lake Road and the Mail Box was delighted to be entertained by several F-15s tying knots in the sky! Drive to Rachel was farther down the valley than I thought it would be but was delighted to come to Rachel and the L'll A'le'inn. Parked and went in to a very friendly reception, nice cold drink and an Alien Burger (What Else?!) We were all ' Boomed ' a few times by F-15s I saw earlier(Or so we assumed). Chuck Clark came in but I did not recognize him as I had never seen a photo of him. 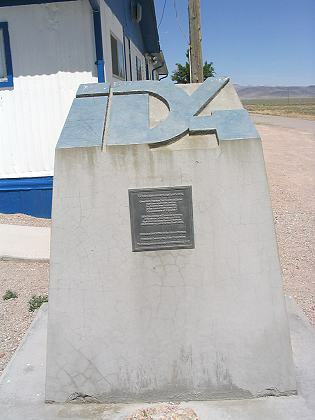 Since I returned home I saw a Discovery Channel documentary about Area 51 featuring Chuck and realized an opportunity to introduce myself and speak with him was sadly missed. I guess that's another reason to plan another trip sooner than later to Rachel. Had a good time chatting with Pat about her time in my "Neck o the woods"- Alabama! Bought a few shirts for friends and employees, bid Pat and her sister good bye and went outside and took some shots of the Inn, signs, time capsule and immediate area. 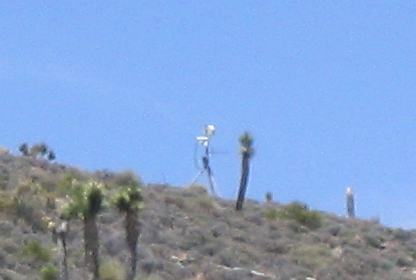 I then turned back south to Groom Lake Road and headed west. First noticed Bald Mountain and the Radar site atop the peak. About 1/2 way down GLR to the signs notice a dust plum on road behind me but was just getting into the hills near the signs so didn't notice where the vehicle making the plum went...It didn't come by me. Found the parking spot on the right (North) of GLR just before the signs and parked my rental PT Cruiser. As I got out of the car noticed the Brown Ford F150 on the hill North and slightly West of the signs. It was at the very top of the hill. I walked down to the signs taking some snap shots as I went until I was in view of the Cammo Dudes. Since I was confronted by signs forbidding photography in this area I chose not to let the Cammo Dues see me taking photos....Probably paranoid on my part but I was alone in a Very desolate spot and decided not to push my luck. I lingered at the signs for maybe 5 minutes and then walked back to my car. By the time I walked back to my car I noticed that the F150 had started to proceed down the hill towards me. I took this as a hint and fired the rental up and headed East back out Groom Lake Road. I saw a dust plume way down GLR almost at 375 but it was headed the same direction as I was( East ). When I reached 375 I turned right ( South ) to head back to Las Vegas. Before I made it to the 375/318 intersection I had seen 3 vehicles, all white, all Ford, with US Government plates headed North. Two were 150 pick-ups one of which had a full toolbox bed like a plumber's truck and the other a plain F150...the third vehicle was a white Ford Expedition or Excursion I couldn't tell which. Then, again on 93 about 20 miles south of the 318/93 intersection saw another white Ford F150 with US Government plates headed North. For those who have never been you must realize these vehicles made up 50~60% of the total traffic I saw! That's a pretty high percentage of US Government vehicles going to a facility that's not suppose to exist! 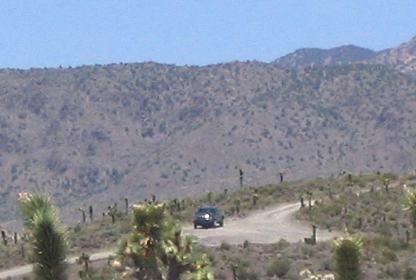 Beautiful country, nice people, and a little excitement awaits visitors to the Groom Lake area. I hope to return and climb Tikaboo Peak to see Area 51 for myself!